Villa BXV in Bronxville, NY, takes home Community of the Year at NAHB IBS 2018. Denver-based interior design and model merchandising company, Lita Dirks & Co., along with their clients, Regal Builders, Taylor Morrison, Builder Magazine, and Gateway Development Group, recently received awards given during The International Builders Show (IBS) last month in Orlando, FL. Lita Dirks was inducted into the NAHB Hall of Fame during the Best of American Living Awards the evening of January 10. Lita joins six classes of industry professionals that have been awarded with this honor. Esplanade at Highland Ranch NEXTadventure Home, located in Orlando FL, was awarded gold for both Best 55+ Interior Merchandising of a Model and Best 55+ Detached Home 2,001-2,500 sq. ft. at the Best of 55+ Housing Awards. Nobles Pond, located in Dover, DE, was awarded for Best 55+ Detached Home and Best 55+ For-Sale Community - On the Boards at the ceremony. In addition to the 55+ Awards, The National Awards Gala was also held during IBS. 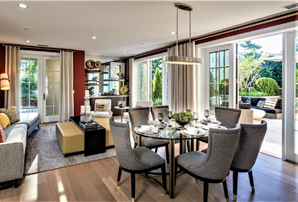 Villa BXV, located in Bronxville, New York, was awarded silver for Attached Community of the Year, as well as a silver for Best Interior Model Merchandising of a Model priced $1 – $1.5 Million. The NEXTadventure Home was recognized for a second time at the Best in American Living Awards, winning gold in both Single Family Production 55+ and Interior Design Production Kitchen categories. Celebrating the best in home design, architecture, interior design, new construction, renovations, green building and affordable housing, the industry and media view these awards as a showcase for quality housing, innovation and emerging trends taking place in the building industry. Lita Dirks & Co. is a national award winning interior design and model merchandising company that has designed model homes, clubhouses and sales and design centers for over 20 years. The firm comprises a team of NCIDQ certified designers who bring sought after designs to their clients throughout the country. For more information, visit www.litadirks.com.